Do you fill you swimming pool daily? Is it cracked and leaking water? How do you fix it permanently? Concrete anchor stitching is a fairly quick, efficient and cost effective way to fix a pool crack repair permanently. The concrete anchor stitching technique involves the use of custom made stainless steel shackles which are engineered not to flex. Tensioning is achieved by tightening the anchor on the machined wedge applying force along the stitch. The stitch length should correspond to the shackle spacing within the slab, bridging the crack and extending into the unaffected areas; spanning well into solid reinforced concrete. The stitch is tensioned by tightening down the anchor sufficiently, without causing the crack to migrate to another part of the slab. When stitches are anchored into the cement, loads are transferred into well intact reinforced areas. An engineered anchor stitch structural system has proven to be an excellent solution to repair significant swimming pool cracks. In the past, contractors often glued metal “U” clips or pins (called stitching dogs) around the crack. Often times this method was not successful and the fracture reappeared. Although epoxy injection is often used, large cracks caused by settlement or other changes need to be stabilized with a structural concrete crack repair process, otherwise they can continue to enlarge. Integrity repair methods restore the tensile strength across the crack. For significant fractures, adequate reinforcing across the crack can inhibit future movement in the slab. For substantial and significant cracks, the objective is to provide adequate anchor stitch reinforcing to inhibit future movement in the slab. 1. Suelo no urbanizable protegido. This is special, protected land which cannot be developed for residential homes. 2. Suelo no urbanizable común. This category has no special protection and can be developed for residential houses for private use. All rustic plots have aesthetic restrictions with each planning zone having different regulations. Normally you have to build a typical regional-style building. For example you would not be given permission to build an Ibicenco (Ibiza-style) house in Valencia. These are urbanised, serviced plots with access roads, water, and electricity. Each planning zone has its own rules although normally the plot size limitation is between 800m2 and 1,500m2, with the “brut habitable” space being about 20% of the plot. In each town hall you can ask for a certificado urbanistico of the plot you want to buy. This is a document signed by the agency of urban planning which confirms the type of plot, the occupation purpose, building space and type of building. When purchasing a property, this is the document that informs you of all the development possibilities of the property. Note: It is advisable to not buy a plot without this certification. 1. Permit for minor works: (Obra menor) walls, terraces, and barbecues. 2. Permit for major works: (Obra mayor) new buildings, alterations, and demolitions. To obtain a building permit for minor works, you need simply request a licencia de obra menor at your Town Hall. Normally this should include a small description of the work to be undertaken and an estimation of the costs. This is so that taxes can be calculated. The tax is paid in advance of the job and is normally calculated at around 4 to 6% of the construction cost. Please note that each Town Hall works independently and therefore, there may be regional variations on this procedure. The building act LOE of 5th November 1999 (Ley de Ordenación de la Edificacion), considers all parties involved in the construction of the building to carry some responsibility. Without prejudice to their contractual responsibilities, the individuals or legal entities that assist in the building process are liable to the owners and third party buyers of the building or any parts thereof, should the building be divided. In the contract all responsibilities and the duration of all said responsibilities should be stipulated. The Spanish government requires all existing homes that are for sale or rent to have an “energy certificate”. The Ministry of Industry has finalised a set of regulations that will make it obligatory for all homes that are sold or rented (in excess of 4 months) in Spain to have an “energy efficiency certificate”. This is a document that describes how efficient your home’s energy consumption is and will cost around 250 Euros for the average home. The promotion of energy efficiency in buildings and homes has formed part of European priorities since 2002, when Directive 2002/91/EC of the European Parliament and of the Council was approved. This directive was implemented in Spain in 2007 through Royal Decree 4 7/2007, although at that time it was only applicable to developers. Now private individuals have to comply and this is likely to stir up strong feelings, judging by what has happened in other European countries where it has already been implemented. The 2002 Directive and the 2010 amendment of the Directive made it obligatory to promote energy efficiency in existing buildings and homes. Consequently, all homes that come onto the market in any country in the European Union, whether for sale or for rent, have to have this energy efficiency certificate, which is valid for a maximum of 10 years. All homeowners who want to sell or lease their property (for more than 4 months) must make this “energy certificate” available to the prospective buyer and/or tenant. The drawback to these new regulations is the additional expense for homeowners. Please refer to prices listed below. Has the royal decree regulating the energy efficiency certificates been approved? Yes, it has been approved and will come into force on the 1st of June, 2013.
Who can issue an energy efficiency certificate? According to the royal decree “energy efficiency certificates should be issued by qualified professional technicians who are authorised to undertake building projects and thermal installations for buildings. The property owner may choose the technician of their choice “. It is a report that describes how efficient a home is in terms of energy consumption and also gives recommendations on how to save money and make your home more efficient. It assigns an energy rating to each home on a scale which ranges from “A” (the best) to “G” (the worst). Will I be able to sell a home which does not have an energy certificate after 1st June 2013? No you won´t. You will have to have a certificate before selling your home. Who will have to pay for the energy certificate? The owner of the property which is for sale or which will be rented. How do I know if the property already has an energy performance certificate? Is there a website to check? How do I receive my EPC? Your assessor will give you the certificate once it has been fully registered and approved. How long is the energy certificate valid for? The certificate is valid for 10 years. This means owners will not have to obtain a new certificate during this period unless they renovate or change the property in any way. If I want to sell my home and it has a poor energy rating, such as D, E or F, am I obliged to make any improvements? No, you are not obliged to make any improvements even if your property has a low rating. Will a low rating affect the sale of my home? Can I sell it without any problems? You are free to sell your home. The only way it will affect a sale is how the rating influences the buyer. At what point in the marketing process of my property do I need an EPC? From the 1st of June 2013 every property being marketed for sale or rent will require an EPC. For existing properties on the market an EPC must be commissioned by the 1st of June 2013. The Autonomous Registration will carry out inspection and administrative controls for properties that are being advertised for sale/rent. a) Buildings and monuments officially protected as part of a designated environment or because of their special architectural or historic significance. b) Buildings or parts of buildings used exclusively as places of worship and for religious activities. c) Temporary buildings with a planned time of use exceeding two years. d) Industrial buildings, defense and agricultural or parts thereof, in the part for workshops, industrial processes, defense and non-residential and agricultural. e) Buildings or parts of buildings insulated with a total useful floor area of less than 50 m2. f) Building purchased for major renovations or demolition. with expected energy consumption of less than 25 percent. How much will the technician who issues the energy certificate charge? Will the technician need to visit the property (generally homes)? Yes. They have to visit the property to take measurements and collect information about the property before drawing up and certifying the report. If you would like to book our technician for your Energy Proficiency Certificate then please email our office at nj@m3bt.com or call us on 962 – 815 – 272. Masonry clay block construction is becoming widely adopted in many European countries and is likely to revolutionize the construction industry. Precision engineered, thermal clay blocks are vertically perforated walling units made from clay and 20% recycled materials. Exceptionally fast to use, they provide a virtually dry construction combined with high strength and thermal efficiency. Reducing build time by more than half, thermal blocks provide an efficient alternative to brick/block cavity wall construction. Absorbing natural energy from the sun as well as heat that originates in the house, clay blocks later release the absorbed heat back into the room air. The absorption and release of heat, keeps temperature variations balanced, thus saving energy. For instance, during winter your house remains comfortably warm, whilst in the summer staying pleasantly cool, keeping heating costs minimal. Additionally, wall surfaces remain dry in every season ensuring comfortable room climates are achieved. Using the clay block system, there is also reduced material consumption enabling builders and construction professionals to achieve maximum build volume for minimum material use. Builders can create accurate, clean and homogenous walls faster with shorter construction times. 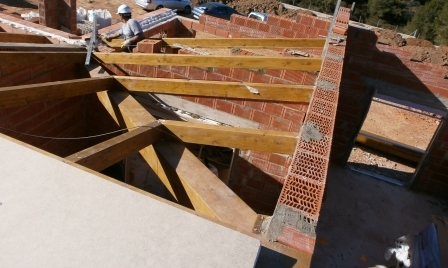 Among additional benefits are faster availability for finishing trades gained from 95% less water usage: as the blocks feature unique interlocking edges giving exceptional rigidity, no vertical jointing is necessary: less repetitive strain gives heightened construction safety, reduced dermatological risk and thermal and acoustical efficiency. Where externally exposed, the blocks are designed to receive a typical render or a proprietary cladding system, functional rather than aesthetic. Internally plasters, or plasterboard over an initial parge coat, are normally used to provide a finish and the primary air barrier. Using thermal clay blocks makes it possible to plan, build and live according to environmental and long term economic principles. Consequently the client benefits from the building being completed sooner whilst the builder sees a quicker return on investment, and is able to complete more projects in a given period, ensuring higher efficiency with better control on time and costs, in addition to fewer errors and a cleaner, more pleasant site. It is a well known scientific fact that water always flows downhill and by the easiest possible route! A slightly sloped trench filled with round gravel and perforated pipe used to divert underground water away from your house is the basic concept of a French drain. This is a common drainage system primarily used to prevent ground water from penetrating or damaging building foundations by providing an easy channel allowing water to flow. The name – French Drain – has nothing to do with France! It was designed and promoted by Henry French, an American judge and farmer from Concord, Massachusetts in his book in 1859 promoting farm drainage. French´s drains were made with clay tiles, but nowadays, 4-inch diameter plastic pipes are used. If you live on a slope and have a persistently wet basement or soggy lawn, a French drain could be the solution. Surface and subsurface water runs through the spaces between the round gravel and perforated pipe at the bottom of the trench which should be sloped. Water can then travel freely through the pipe, emptying a safe distance from the house. A shallow French drain, or curtain drain, is useful if there is a problem with surface water—a soggy lawn for example, or a driveway that continually has water rushing across it. This type of drain need not be very deep, just sufficient to divert water.You may need a deep French drain if the shallow drain doesn´t keep water out of your basement. This is also called a footing drain and runs round the perimeter of the house at footing level. It is easy to install during house construction – but obviously difficult and more expensive to add later. French drains depend on gravity, so a flat property may need to pipe collected water to a basin in the basement where a sump pump can lift it and send it to the storm drain system.You can also build an interior French drain if you can´t keep water out of your basement, to intercept the water where it comes in. Cut a channel around the perimeter of the basement floor, chip out the concrete and install perforated pipe all the way round. Solid pipe then carries the water to a collection tank sunk into the floor and a pump sends it out to the yard or storm drain.Incorporate a French drain behind the first course of stones or blocks if you are building a retaining wall on a hillside. Otherwise the wall could be undermined or even tipped by water moving down the hill or building up behind the wall. As clogging with silt must be avoided, drape landscape cloth across the base or footing and up the slope before adding the pipe and drain gravel. Nearing the top of the wall, fold the cloth over the top of the gravel and cover with several inches of soil. Sin lugar a dudas, una casa tradicional, suele ofrecer carácter, un amplio espacio y, a menudo un precio más barato. Sin embargo, tenga en cuenta que junto con el precio más bajo puede venir el problema de mantenimiento, como la infestación de insectos o de humedad que pueden requerir de una solución costosa. Tenga mucho cuidado, no se confíe y piense que es oro todo lo que reluce, asegúrese tras una bonita apariencia no se ocultan graves problemas. Debe buscar indicios, como que las vigas del techo se hayan cubierto o que en ellas se aprecien pequeños agujeros en la madera. Si la madera al descubierto se ve mal, lo que hay en las paredes será mucho peor. La pintura sobre la superficie de las vigas no es una solución válida y no supone ninguna solución a la presencia de carcoma. Eche un vistazo a los marcos de madera de ventanas y puertas , ponga especial atención a los dinteles de madera de soporte de carga. En una construcción antigua, con frecuencia el techo no se ha reparado en años, y los antiguos métodos de construcción, en general, eran pobres en lo que al aislamiento se refiere, por lo que un fallo muy común en estas construcciones suele ser las filtraciones de agua. Igualmente, el deficiente drenaje y el pobre sistema de canalones en el exterior puede ser lo que de lugar a la humedad capilar. En pocas palabras, la posibilidad de tener un estudio de la propiedad realizado por un profesional ANTES de realizar una oferta, es el comienzo ideal para la realización de una compra, así sabrá usted exactamente lo que tiene delante. Solicite el estudio a un técnico cualificado y si la edificación necesita una restauración, solicite un presupuesto del trabajo. Con esto usted podrá realizar una oferta en consecuencia con el estado de la vivienda. Nunca se sabe,¡ podría ser el negocio que está buscando! Desde Mayo del 2000 se hace obligatoria la “Garantía del Constructor” en todas las edificaciones de Nueva Construcción, esta garantía recae sobre el constructor, el cual debe dar garantías del trabajo realizado durante diez años mediante la contratación de un seguro. Es importante señalar que las primeras garntías de estas características que se formalizaron están a punto de vencer. Por lo tanto ¡Animamos a los propietarios a actuar ahora! Si usted tiene cualquier agrietamiento en su propiedad, es importante que esto se valore, y en caso de ser necesario, se informe a la aseguradora de su garantía y al arquitecto antes de que esta venza..
Si usted tiene alguna preocupación en cuanto al estado de su propiedad, es importante que busque una opinión profesional. Lo que podría parecer sólo pequeñas grietas podrían ser los signos iniciales de un problema más grave, por ejemplo, un hundimiento. Una vez que pasen los 10 años reglamentarios usted no podrá hacer ninguna reclamación a la compañía aseguradora sino informa de estos antes de que la póliza expire. Las aseguradoras decenales, son huesos duros de roer y en muchas ocasiones es necesaria la intervención judicial para que respondan a sus compromisos. Aun cuando la propiedad se encuentra bajo garantía, para el comprador, es una prioridad contar con el estudio estructural de la propiedad que está pensando adquirir, incluso si el constructor o el agente inmobiliario lo desaconsejan, ya que este estudio podría evitarle futuras molestias y tediosos procedimientos. May 2000 required a ´builders´guarantee´ on all newbuild properties to be insured via a ´Decenal´ insurance policy. It is important to note that the first guarantees are now in the process of expiring. So we urge people to act now! If you have any cracking at all in your property, it’s important that this is assessed, and if appropriate reported to the your decenal insurers and architect prior to the expiry of your decenal guarantee. If you have any concerns as to the condition of your property, it is important that you seek a professional opinion. What might look like just minor cracks could be the initial signs of a more serious problem, for instance subsidence. You will have no claim later against the decenal insurers if you do not report this to them prior to the expiry date of the guarantee. Court action is often required to get results from decenal insurers who are notoriously difficult to claim against and both existing owners and home buyers should be aware of this. Even when the property is under guarantee, it is very important to have a buyer´s structural survey even if some developers and estate agents state it is not necessary. Without a doubt a traditional town house would offer character, ample space and often a cheaper price tag. However, be aware that along with the lower price can come maintenance issues like damp or insect infestation which will make for a costly renovation. Be very careful to ensure that what looks good on the outside is not just camouflage and hiding a multitude of problems. You must look for clues like if ceiling beams have been covered over or there are small holes in the wood. If the exposed wood is soft and pliable, what is in the walls will be far worse. Note that painting over the surface of the beams is not a valid solution and won’t stop the attack. Take a look at wood window frames and doors for further evidence of wood worm paying special attention to any wooden load bearing lintels. In an older property often the roof will not have been repaired in years and older building methods generally were poor allowing water to get in is a common fault. Equally drainage and guttering on the outside of the property could very well be inviting water into the surrounding ground which will manifest as rising damp. In short get the property checked out by a buildings surveyor BEFORE you make an offer so that you are fully aware what you are in for. Take the report to a qualified builder and get a quote for the work and then offer accordingly. You never know, it still could be the bargain you are looking for!